In today's economy saving money is a huge priority. This blog is dedicated to those who want to pinch some pennies and stretch a few dimes. Do you ever wonder how you can continue to make ends meet when those ends get further and further apart each month? I'm not sure if you've felt the pinch of this economic season in your own wallet or not, but chances are you are like most of us who look at your expenses and wonder where it all went. How do we turn our spending into saving, especially now when times are tight? You can learn a few tricks about creating a budget, shopping sales, saving money at the grocery store, using the internet for outings or trips, and a few more money saving tips in the article, How to Turn Spend Spend Spend into Save Save Savings. Check it out, you might be amazed at how the little ways you save can add up to some big savings! In today's busy households with double incomes, mortgages and high personal debt and portfolio management to stay ahead the right home budget software becomes a huge asset. It is one thing knowing your household finance goals it is another to achieve them.What can we do to stay on top of our personal finances? Home budget software makes managing your household finances easy and simple. Quicken and Microsoft money sync with your bank accounts to let you pay your bills online and manage your finances and portfolio. E-Z Home Budget Software uses Excel to manage your personal finances. Home budget software brings stress relief, discipline and planning. Click here to Find the Best Home Budget Software for your family. Are you tired of staring at those credit card bills with large balances? Does your credit card payment disappear into the abyss due to your large interest payments? Do you have bank credit cards as well as cards issued by regular credit card companies or department stores? If so you are not alone as millions face unmanageable credit card debt each month. When you get to the place that your credit card debt puts you in a position where you cannot make reasonable payments to overcome the debt, the convenience changes to potentially ruinous situation. Many people have had their credit damaged in such a way that even in the current period of record low mortgage rates they cannot take advantage of the situation due to their credit being rated at such a poor level. This plague has made us captives to our plastic. We must change the way we handle our cards so they are not our master. What can you do? Click here to see how you can Pay off my debt::credit card payment to reduce debt::pay credit card balance each month to reduce debt Start today. This will save your money and your credit rating in the long run! Save Money at the Grocery Store! In today’s economy, money is tight! Everyone is looking for ways to tighten their budget and make their income stretch as far as it can go. If you’re having trouble making ends meet, then you know what I’m talking about! I’m learning to stretch every dime and save every penny. I’ve learned there are several ways to save money at the grocery store! I used to think that shopping at my local Wal-Mart Super Center was the best way to save on groceries, but now I know there is a better way. Wal-Mart isn’t bad, especially since they will match other grocery store’s sales ads. However, I’ve learned that they do not double coupons! A fifty cent coupon is much more valuable at Fry’s than it is at Wal-Mart. Have you ever tried an on-line coupon system like Coupon Sense or Savings Angel? These systems help members organize their coupons and learn how to make the most of them. Personally, I prefer Coupon Sense. Their comprehensive data base helps me combine coupons with grocery sales prices to gain at least a 50% savings every week! 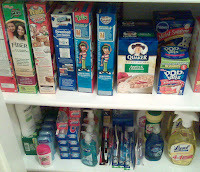 Not only have I saved a ton of money by using Coupon Sense, I’ve also created a stock pile in my pantry. No more running to the store at the last minute because I need something. 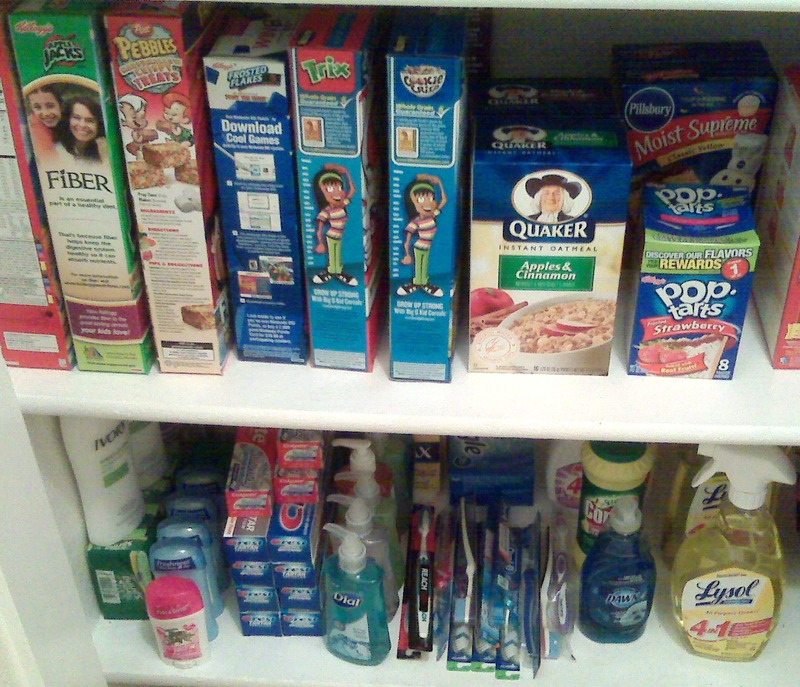 I have everything I need and then some waiting to be used in my pantry. I used to think that clipping coupons was a waste of time… now I know that each coupon is worth at least a dollar as many stores will quadruple the value up to a buck. Coupons are money! It’s been great to be able to cut my grocery bill in half! Click here to read more about my experience with Coupon Sense! The only downfall with Coupon Sense is that it is only available in certain area. However, if Coupon Sense is not available in your area, you can always subscribe to the Coupon Sense blog for some great money saving ideas. Savings Angel is another on-line coupon system that you may want to consider. While I didn’t like their system as well as Coupon Sense, it is available in more areas and is a great alternative. Why not give them both a try? Click on this link to read more about my comparison of Coupon Sense and Savings Angel. Another way I’ve learned to save money is by taking advantage of my local food co-op. By signing up with Bountiful Baskets, I can save money and provide healthy foods and snacks for my family. Local food co-ops are a great alternative to purchasing expensive produce. They even offer organic baskets. If you prefer organic fruits and vegetables, then you know how expensive produce can be. 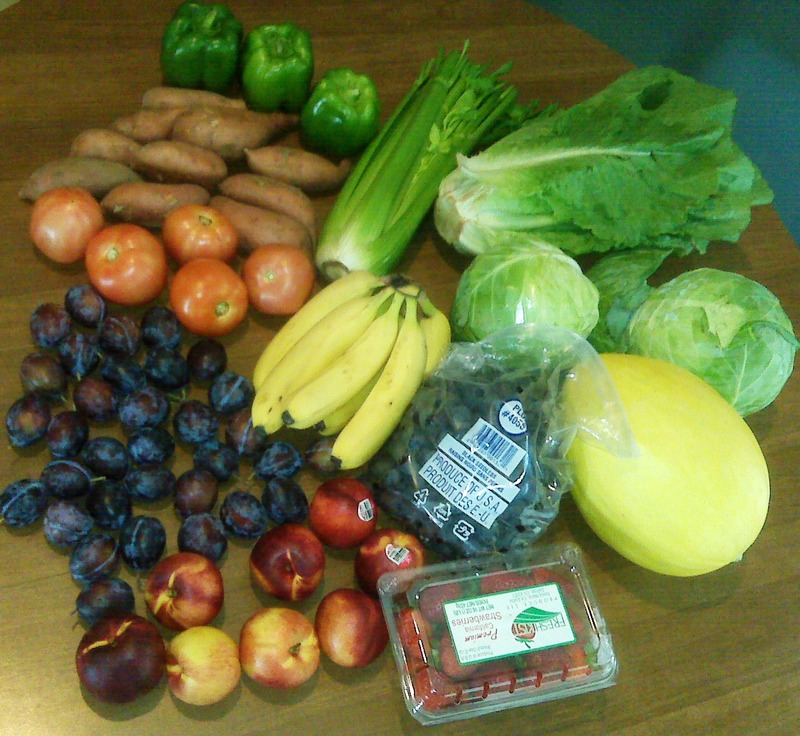 By spending only $15 a week, I’m able to have more than enough fresh fruits and vegetables. I’m even able to share my extras with friends and family. You can click here for more details on how I'm able to save money with fruit and vegetable baskets. With all this food that I now have in my house, I’ve found a great way to prepare fantastic meals! By using my crock-pot, I can save both time and money. There are so many uses for the crock-pot! My favorite, however, is for almost any type of meat. Beef, chicken, pork – whatever! This has been a lifesaver as a working mom. Click here for more ideas on time and money saving ways to use your –crock-pot! Thanks for reading! Let me know in the comment section below some of the ways that you save money at the grocery store!